Another unknown cat. 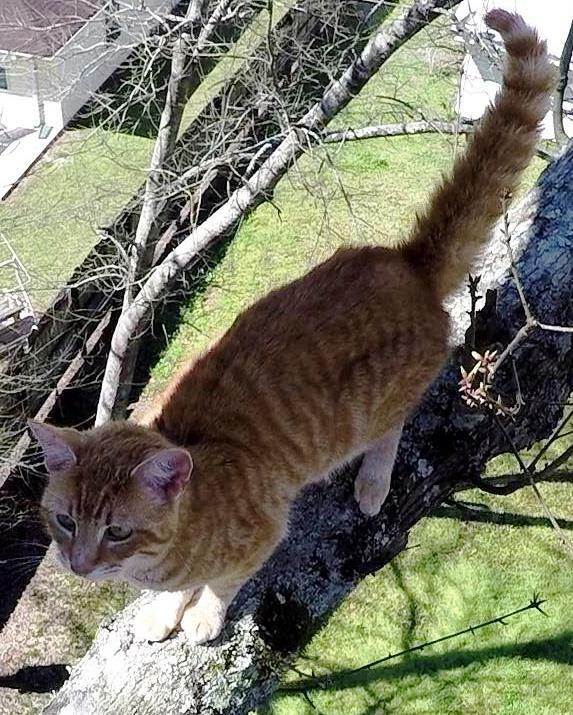 This time it was an orange tabby that was stuck about 45 feet high in a backyard and he had been there for 6 days. The neighbors had been hearing him calling for a few days before they finally found him. 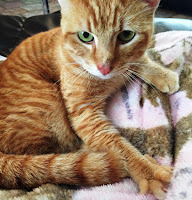 No one knew the cat, if he belonged to anyone or if he was tame or feral, but Tara, one of the neighbors, called me and offered to take responsibility for the cat if I could rescue it. At first I was encouraged by what I found. The cat's behavior and vocalizations gave the impression that he was tame and eager for human help. In fact, I was so sure that he would be cooperative, that I did not even unload my rescue pole or net. 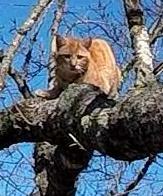 When I began climbing the tree, however, his demeanor changed. Now he was afraid, and he perched about 15 feet out on a long branch. I could have walked out on the branch toward him since it was large enough, and I had good places to tie some support ropes over it. But that would have just given him more reason to be afraid, and he would have gone even farther out on the limb making the rescue more difficult. Instead, I wanted him to see me as a friend and to come to me. The best way to do that is to offer him some food. I put some food on the end of a long handled feeder and held it out to him so that he could eat from it while feeling a safe distance from me. He was interested in the food, but he took a long time to go to it. My plan was to entice him closer to me by gradually pulling the food closer to me as he ate, but he was too cautious for that. When he first reached the food, he slowly took a mouthful of food and quickly pulled back away to eat it. He came back for a few more trips, and while I did manage to get him to come a little closer, each time he would get a mouthful and retreat to eat. After a few trips like this, he appeared to be satisfied with what he had eaten and was not motivated to get any more. Food was no longer a motivation for him, and he seemed content to just sit there a lot longer. He had won this battle, so it was time for me to advance to the next level. I called for the rescue pole. After I pulled it up to me and got myself properly positioned, I practiced the maneuver to make sure I was ready. He was resting on the branch about 11 feet away from me at this point, so I reached out just about as far as I could and tried to position the noose around his head and under his front legs. He was not disturbed by this at all. He stood up, which is what I wanted, and stepped through the noose just the way I wanted. As I started to tighten the noose around his upper chest, he quickly stepped his back legs through the noose and was free of the noose altogether. At this point, the most surprising thing happened. While I was berating myself for missing my chance to snare him, he decided to walk quite calmly all the way down the branch to me. He stopped in front of me, and I reached my hand down for him to sniff. Then he let me touch him. He was ready for some loving. I happily put the rescue pole away and spent some more time giving him some loving. Then I got the food back out for him, let him sniff it, and then put the food in the back of the carrier while he was watching. He calmly walked on into the carrier while I gave him some more back scratches. I closed the door and prepared to bring him down. There's just no predicting cats. When I brought him down, Tara was waiting for him. She wanted to keep the cat until the owner could be found. If no owner was found, she was ready to adopt him herself. We took him over to her house to release him in a bathroom where she had already prepared a bed with a warm electric blanket for him. 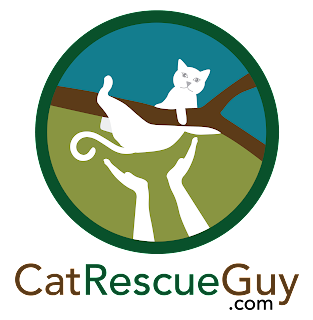 It is rare that I get to see my rescued cats released and even more rare for me to be the one to release them, but because I wanted to scan the cat for a microchip and the bathroom was small, this time, at least, I had the honor and pleasure of releasing him. He first scanned the room to make sure he was safe, and then he was ready for some serious loving. He vigorously rubbed against my legs and hands back and forth, over and over, as if to say, "Thank you," and I enjoyed every minute of it. It was such a joy for me to experience that this time, and I thank Tara for allowing me that reward. I could not find a microchip, but Tara had planned to alert all the neighbors to see if he belonged to any of them. I think she is not so secretly hoping that no one claims him, because I think she wants to keep him for herself and her girls. When her girls came home from school, they were happy to see him, and they have already given him a name. They named him Simon, so that is what I will call him too. Tara sent this picture of him after he finally settled down. I don't know why, but I have no video of my attempt to snare him with the rescue pole. I had turned the camera on and off a few times because he was taking so long to do anything, and we spent a good bit of time just getting used to each other. But I thought I had turned it back on for the rescue pole. Apparently not. That scene is mysteriously missing.